Our master bedroom makeover has been one of my favorite DIY’s to date! And it was so affordable for a total room overhaul, just around $400. For that amount we ripped out the carpet, installed DIY plywood floors, and painted every surface (walls, molding, ceiling, floors). We used all of our old furniture and rearranged it, stole a rug from another room, and found the perfect side table on the side of the road. The only thing we bought for this room was a round mirror from Target for around $40. Hopefully this makeover will encourage to rethink what your rooms can look like if you are craving a change, the power of paint and a little rearranging never ceases to amaze me! Scroll down to see what the same view above looked like before. Looks pretty different right? If you notice from the after image, the nightstands in the before picture are now pushed together to create a dresser. Same pieces but totally different feel! Our downstairs has wood floors and tile in most rooms but our master and hallway had carpet which always bothered me. It also was always super dirty because the hallway outside our master is a main thoroughfare. I finally got so tired of it I just randomly ripped out the hallway carpet one Friday night. I knew there was a chance the original hardwood floors were under there and honestly even painted subfloor seemed better to me than the old dirty carpet. Well good news and bad news followed (as happens with most renos) . The original hardwoods were under some of the carpet but it was patched in with plywood and engineered hardwoods as well. So we lived with the subfloor for about a month while we decided what to do. I also decided I wanted to paint and rearrange our bedroom so I sold some furniture I didn’t have a spot for anymore to pay for the renovation (selling the furniture paid for the whole redo!) 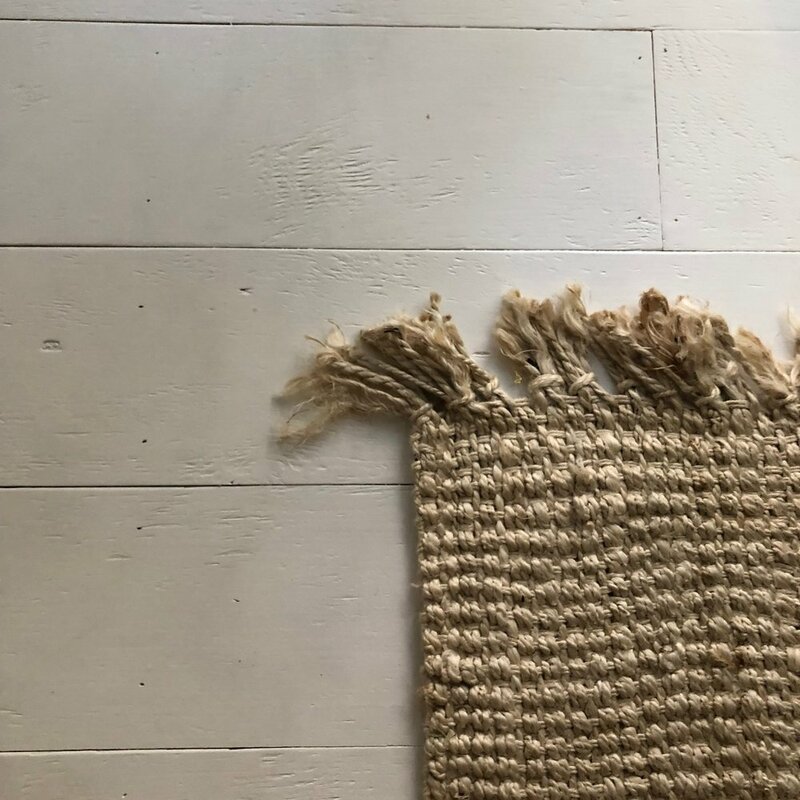 I searched and searched pinterest for some DIY alternatives for wood floors and decided to go with a version of this DIY from the queen of DIY, Jenny Komenda. So we moved our mattress into the dining room floor, which the twins thought was the best thing ever! We worked during nap times and after the girls went to bed and finished the whole thing in about two weeks. We left the carpet down in the bedroom while we painted. We had navy/black in this room before so we did two coats of Zinsser primer (the best) before we painted the walls. I wanted to create a cohesive look with all the wood we had going on (trim, paneling, and wood floors all painted) but I also wanted some layering. So we painted the trim, paneling and wood floors all White Dove by Benjamin Moore which is a good clean white. Then we painted the walls and ceiling Grey Mist by Benjamin Moore, its a really good chalky white. It has depth without looking grey or yellow. Then we started on the floors, patching in the new plywood to where the old hardwoods stopped. I thought long and hard about what to do since we would have different floor widths in the same room but I decided it wouldn’t bother me if it was all painted cohesively. But halfway through I did get a little nervous when I saw the differences but now it looks great! Our house is almost 100 years old and has a lot of paneling and different wood widths throughout the house so I hoped it would all blend in, and it totally does! Just looks full of character (best word for quirky old house things). In the picture above you can see the original narrow wood and then where it stopped and we patched in the wider planks. We got our plywood at Home Depot and they cut them into 8” planks for us in the store with no charge (8” planks meant there was no overage or waste from a sheet). We found this website with good tips on how to get them to cut it for you with no charge, we did everything they suggested and they cut it no charge! So it worked for us! Then I sanded each board with a palm sander (just roughly, I spent about 3 to 6 minutes per board). As I sanded Luke installed and we got almost the whole room installed in one night after the girls went to bed! We butted the boards up next to each other to install. The boards weren’t all perfectly straight so there are some gaps which I think makes it look more like real wood floors. We installed with a nail gun and didn’t fill the holes either, going for that gappy original look again. We had one or two big gaps where we put a little wood filler but overall didn’t have to do much. 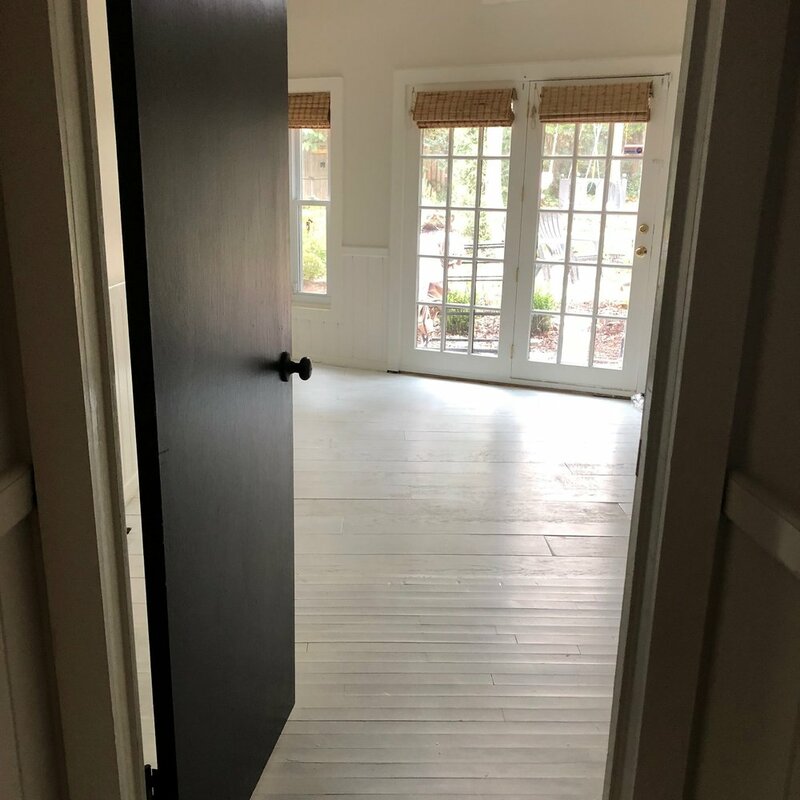 After Luke installed quarter round we primed the floors (with zinsser again) and then did two coats of porch and floor paint. We didn’t seal the floors, which seems like a hot debate in the DIY wood floors world. Overall what I found is this. Some people sealed and some people didn’t and there isn’t a ‘right’ way to do it. From what we found, porch and floor paint isn’t made to be sealed since its made to be outside anyhow so we chose to not seal it. If I need to touch up the paint I would rather do that instead of having to touch up a poly finish. But that’s just me! Here you can see what it looked like when we were patching everything in… and below is after paint when Luke was installing quarter round, supervised by Wren. And here’s the view now into the bedroom now! And here’s a before and after of the new bed wall! What a difference paint makes! I loved the dark but was ready for a change and the light feels so special to me. The bed stayed the same, the pillows I grabbed from another room and the side table I found on the side of the road. YES THE SIDE OF THE ROAD. I cleaned it up and it will now live a long and happy life in my house. I stole the rug from the nursery where we had two rugs layered so its totally fine and the sconces I stole from the nursery too. We finally found the perfect home for this favorite chair from our last house. Its now the perfect corner to read in (or throw clothes on. you know how it goes). We are now a few months into these floors and they have held up SO WELL. Like better than I thought well. I could mop them but haven’t had to yet, if they get any dirt on them I just mainly grab a baby wipe and it comes right up. I love love the look of them and would do it again and again! If you have any questions about them I’m happy to answer them, just email me from this page or head to my instagram (@eileenandco_). I have a saved story highlight on my instagram with all the step by step details of when we were doing them if you are interested too! Welcome to the last week of our Living Simply series, today is all about ROUTINE. A little refresher… I’m teaming up with 3 of my favorite local bloggers to share how we are focusing on mindful, purposeful living in various areas of our lives this fall. Go here for week one which was all about mindful rhythms of self care for MAMA and go here for week two about KIDS. Go here for week three which was all about Living Simply in our HOMES. Make sure to visit the other blogs, I’m excited to see how all four of us pursue the same goal of purposeful living in different ways. The White Buffalo Styling Co / Amber Tysl / Grace While We Wait / Eileen and Co.
Today is all about ROUTINE and I’m so excited about this week! I’m going to share a few ways that we changed up our routine last year that has changed our family life for the better. Its all about the witching hour, that time between 4-bedtime when everyone is tired from the day, cranky and hungry. The house is so messy and dinner needs to be made and cleaned up. Baths need to be done and the house straightened up from the day and by the time you finally crash at 9 you are exhausted. Is your stress level rising just thinking about it? Mine is. Last fall we were deep in the trenches with two 3 year olds and a newborn. We felt like we were running a race every night until we finally crashed in bed. The dishes never seemed to be done and the laundry was piling up every night. I finally realized that if we weren’t intentional about that 4-7 time and pursuing peace in our days it definitely wasn’t going to happen by accident. 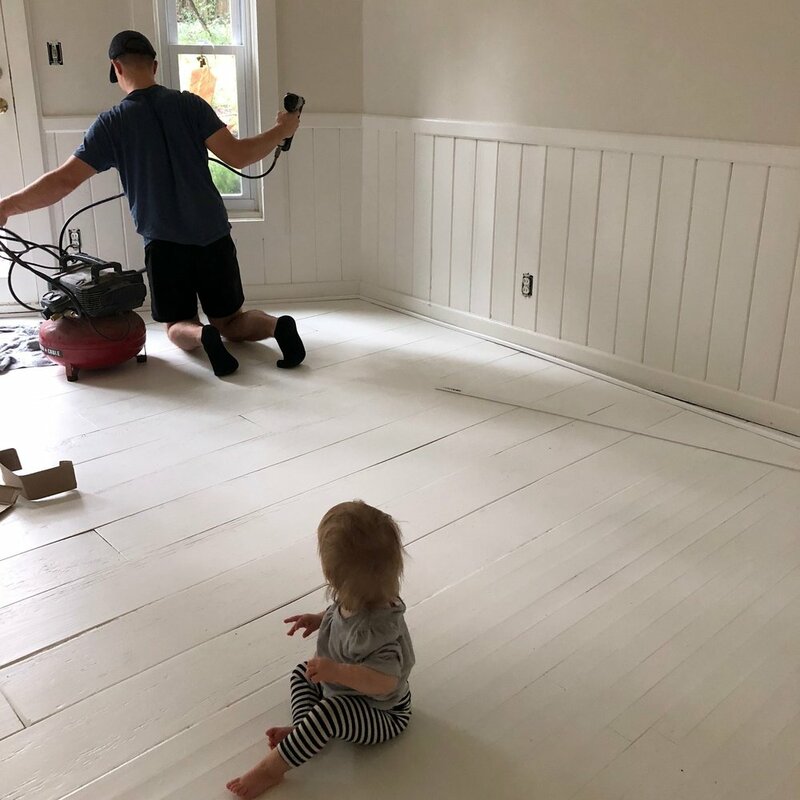 Our goal was to have the kids down and be done with most housework by about 7 so we could work on house projects (this is when we get a lot done!) or be able to rest and recharge. I’ve had people ask how we do house projects with three young kids and this is how! If we are done with housework by 7 then we can work from 7-9 on projects. Disclaimer: right now our girls are good sleepers. They go to bed consistently early (by 6:30) since we dropped their nap and they sleep all night. When we go through sleep regressions and things like that its definitely more of a struggle to be done by 7. This is definitely not a ‘how to’ post. I’m going to share our normal daily schedule but not at all in a ‘this is the right way to do it’ way. Every family is different. Your family may stay up later or have ball games after school or things like that so this is not about the exact schedule we follow as much as it is about the concept of pursuing peace in your schedule in a way that works for you. If you have a consistent area in your family life that causes stress then I encourage you to sit down with your partner or kids if they are old enough and brainstorm simple purposeful ways to alleviate stress. You may make dinner in the mornings after school drop off or only do baths every other day. Your schedule and stress points will look totally different based on you and your partners schedules, personalities, dinner and bath preferences but I thought I would share some of ours in case it helps anyone. Our schedule will change as the girls grow and we enter different family seasons but I hope we always pursue peace in our home. Last year around Christmas we sat down and wrote down pain points in our schedule and came up with ideas on how to fix them. We worked backwards from the time we wanted to be done and came up with a pretty detailed schedule for a ‘normal’ weeknight. It gave us goals and we’ve done pretty well sticking to them. Side note: Luke gets home around 4:30 every day when he is in town so he is there to help. But he travels a lot a week at a time for work and I stick to this schedule when he is gone as well and it saves me! Doing everything solo is exhausting (single parents, you guys are HEROES), but when I know I’ll be done and be able to rest at 7 with a clean house it makes a huge difference! 4:00- do a quick 5 to 10 minute straighten of the house. Not the playroom, normally we straighten that right before bed. If we straighten it at all. Its one of the things I’ve let go to stay sane. As long as the girls are working to keep our shared family spaces clean by picking up toys throughout the day I typically let them have as much freedom as they want in their space (freedom is my code name for them making a mess I don’t clean up). 4:30 - Luke gets home and we go on a family walk. (If Luke is out of town this is when I bathe the girls). 5:15 Luke bathes the twins while I make dinner. (If Luke is out of town the twins play in the playroom or watch a movie while I make dinner). Baths before dinner made a huge difference for us. Getting up after eating dinner with a dirty kitchen and wriggly tired babies to bathe added so much stress. Now that the twins are 4 and don’t get tons of food everywhere while they eat baths before dinner totally works for us. While I’m making dinner I try to clean the kitchen as much as I can. My goal is to sit down to dinner with a mainly clean kitchen so its just plate washing after we eat. I do lots of roasting (on foil so easy cleanup). We roast vegetables and chicken sausage and have it over rice and gnocchi. There are so many variations of that as well and I love roasting because its just chopping and then you have 30 minutes while it all cooks. Easy dinner! We also do lots of crock pot meals and soups, etc. Sometimes I will pull together stuffed peppers or something like that in the early afternoon so its just sticking it in the oven while we go on a walk. 6:15 Luke puts Wren down while the twins and I read, right now its their Bible and the illustrated Hobbit. Brush teeth and then bed for twins at 6:30 or 6:45. 6:30 Final straighten of the house and kitchen. Laundry folding normally happens after 7. I try to move all the laundry over throughout the day as I can so its all clean and then fold it all while watching TV after the girls go to bed. I know that sounds super detailed and structured but it really just gives us normal rhythms that the whole family falls into. The girls relax so much more knowing what is coming next and I’m much less stressed. Doing these few things makes family dinner relaxing, I’m not worried about how much more we have to do or who is going to bathe the girls. I can actually focus on them and enjoy our time together. The twins also love our reading time before bed, we snuggle up on the couch and read the Hobbit and pray together and its a really sweet way to end the day. Our home is still crazy loud and people get cranky because they are tired and hungry but having a plan just takes away the added stress of ‘when do you want to eat? Do you want to bathe them now or later?’ Having this plan sets us up for success and has made the biggest difference in our home over the past year. That’s the end of our Living with Simple Purpose series! I hope it was encouraging to you, I know I loved seeing how my friends pursue simple living in their homes. Writing posts like these helps me reflect on our family values and gives me inspiration to keep at them. I’m so grateful for each of you readers, thanks for being here! Welcome back for our Living Simply HOME week! I’m so excited about this week, I hope it encourages you. A little refresher… I’m teaming up with 3 of my favorite local bloggers to share how we are focusing on mindful, purposeful living in various areas of our lives this fall. Go here for week one which was all about mindful rhythms of self care for MAMA and go here for week two about KIDS. Make sure to visit the other blogs, I’m excited to see how all four of us pursue the same goal of purposeful living in different ways. Today I’m going to talk about life paced design, design that follows real timelines and limitations. We live in a world of instant gratification and social media is filled with beautiful homes in which every detail is well thought out and special. It can be so easy to look at those photos and compare our homes and see our unfinished to do list and empty spaces. But what we don’t see behind those photos is the years of collecting and rearranging. We don’t see the mess of progress, the sheetrock dust covering every surface before the finished bathroom is revealed. We don’t see the hours and hours their interior designer poured over plans and furniture placement before install day. In our realities, most of us are limited by time and budget. We may have a vision of what we want our home to feel like but it will take us a while to get there, aka life paced design. I’m here to say that life paced design is GOOD. Waiting for the right vintage piece is GOOD. Waiting to be able to afford that leather sofa is GOOD. Finding that perfect mirror that fits in your budget is GOOD. Playing around until you find the perfect balance of accessories is GOOD. Having the patience to enjoy the process and see your home come together over time is a sacred thing. Its GOOD to learn to live in the mess of progress and then one day we can enjoy the finished result and remember the work it took to get there. I thought I would take you on the life paced design story of my kitchen. We renovated it three years ago and since then I’ve been playing with accessories and waiting for the perfect finishing pieces, and after three years I finally feel like the space is ‘me’. 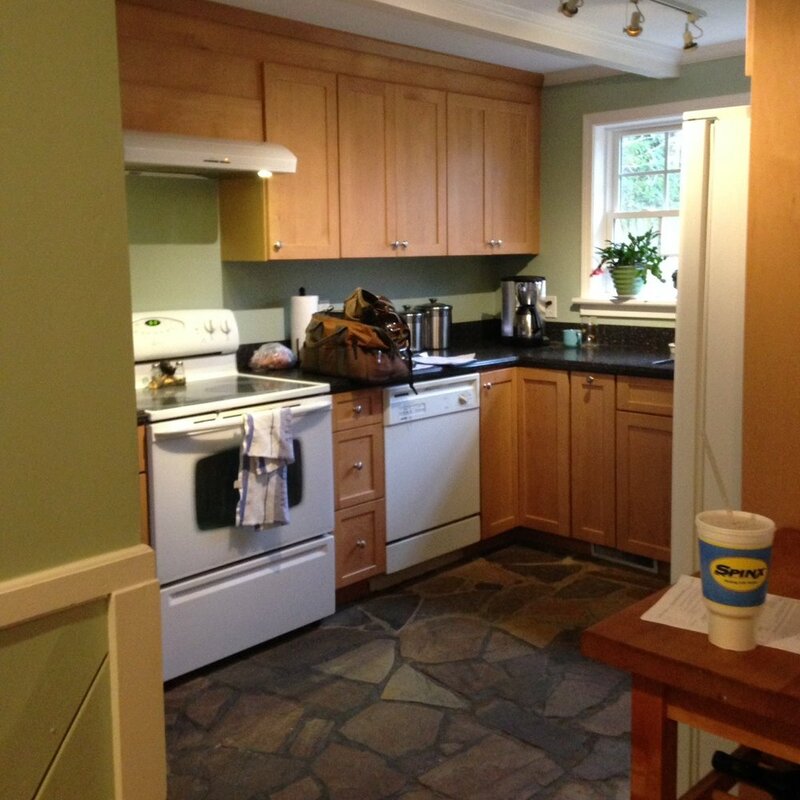 When you look at a picture of my kitchen now I want you to see the three year process it took to get here. I want you to give yourself grace and enjoy the process of making your home feel like you and the people you share it with. I want you to not just see the finished result but also see life paced design. This is our kitchen when we first bought the house and then right after we started reno. We took the floors down to the studs but saved the solid wood cabinets. We added a peninsula, painted every surface, did new countertops, redid all finishes and replaced the appliances (donating the old appliances and countertops). We lived with the cabinets half painted for at least a month while we did other things and only had half tiled floors for a few months as well. After a good 6 months of renovation we ended up with this, note the unpainted baseboards (that took a month to do too). Then a few months later we built our hood! We were finally finished with all the construction elements! From there I started the search for those final finishing touches that would make the space feel like us. I was dying for copper pots to hang over the stove but knew it would take a while to find some I could afford. So for the meantime I found these vintage blue and white plates and hung them over the stove and liked the look for sure but had the copper pots in the back of my mind. I felt like I was getting there with accessories but it never felt ‘finished’ to me. And here we are today! I found some copper pots after a couple year search for $40 at my favorite local spot (Route 276 for you Greenville peeps!) and completely feel like they finish the space. Purposeful touches finish the space like our ‘collection’ tray where the girls put special rocks and things we find out walks. My favorite portrait of a lady (from @hohumhollow) lives next to the window and makes me smile every time I see her. A vintage rug from Etsy adds color and softness in front of the sink. Plants live in the window that I’ve miraculously kept alive for a year and just make the space feel cozy. All these little things I’ve collected over time, aka life paced design, tell the story of us and fill the space with meaning. I’m encouraging you to think of what pieces in your space tell your story and what brings you the most joy in your home and celebrate your own life paced design jouney. Welcome back! I’m so grateful and excited that this series seems to be resonating with so many of you, it’s been on our hearts to share for a while! 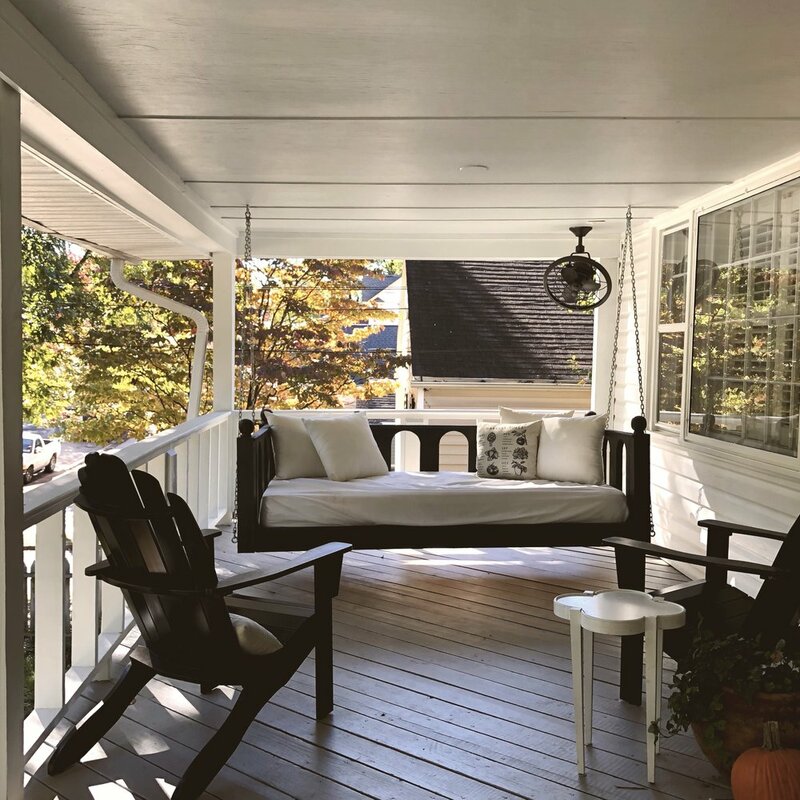 A little refresher… I’m teaming up with 3 of my favorite local bloggers to share how we are focusing on mindful, purposeful living in various areas of our lives this fall. Go here for week one which was all about mindful rhythms of self care for MAMA. This week is all about Living Simply KIDS and I hope it’s inspiring to you! I’m mostly excited to see how four different mamas seek the same goal of intentional living with different families, personalities and gifts. For those of you who don’t know, I’m mama to three girls. 4 year old twins and a 1 year old. The twins came into the world fast and furiously at 31 weeks with an extended NICU stay. I talk a lot about that experience and how it shaped my experience of motherhood in this article on The Everymom. Wren was born at 39 weeks and got to nurse and come home with me from the hospital, both things I missed with the twins and it was such a redemptive experience. This past year with Wren and the twins has been such a sweet year. 4 is such a fun age and Wren just smiles all day and sleeps 13 hours a night (PRAISE). For this Living Simply KIDS week I thought I would share one of our overarching parenting goals and how we are pursuing that in simple and easy ways throughout our days. One of the most important principles of our parenting is to raise girls who are confident in their God given abilities and gifts and who work hard to pursue their calling. Confident - because their confidence is rooted in the power of Jesus to work through every circumstance for their good. Confident- because they have a family who is fighting for them to become who they were created to be. Confident- because their gifts are being built up and encouraged. Confident- because they were taught to think and not take things at face value but have the ability to dig deeper and make their own decisions. Confident- because in Jesus weakness is strength and its not up to us to be perfect or strong. Confident- because Jesus calls us enough and loved we don’t have to strive for other’s approval. Our goal as parents is to (imperfectly) live out and pursue these truths, speaking them over our girls so much that they become part of who they are. Here’s a few ways these truths play out in our home in simple ways that built on things we were already doing. Independent thought. With the constant stream of questions coming from two 4 year olds I’m always trying to turn the questions around on them and ask them what they think and then encourage their ideas. “Why are there so many clouds mommy?” “Why do you think there are so many clouds? Do you think its trying to tell us something?” Their responses are hilarious. Decision making confidence. I try to give the girls little decisions to make around the house and then encourage their thought process on those decisions. Even if its just asking them what they want to wear and then complimenting what they choose. Getting one on one time is so important, especially with twins that are lumped together so often. We turn Trader Joe’s and Home Depot runs into dates. Reading Reading Reading! Right now we are reading the Illustrated Hobbit out loud and its been so fun! It’s only 5 or 10 minutes most days but its becoming such a fun tradition. We snuggle on the couch with blankets and read right before bed most nights. Lots of time outside. We got on walks almost every day and the girls will walk up to 3 miles with us. We are constantly talking about the colors of the moss on the ground and how soft it is or how the wind blows our faces and the trees. Play based learning! Building forts is a great way to learn about structures and strength of materials. Role playing restaurant and house are also big around here. We build chipmunk houses outside using leaves and sticks and make kitchen, baths and beds for the chipmunk at our local park and then they run to check on the chipmunk house every day when we walk! Grace to mess up and have hard days. Teaching them that we all have hard days and mess up gives them grace and takes the pressure off of constant perfect performance. I try to apologize to the girls throughout the day as I mess up and always point it back to Jesus and how we all need Him and He gives us so much grace and forgiveness like we need to give to each other. All these things we do are very easy and add onto things we already were doing. We already went on walks a lot but being purposeful about pointing out beauty while we walk builds a culture of beauty in our home. We already played in the playroom but asking the girls to build a fort and see how they attach the blankets and point out the structure is an easy 2 minute conversation. We already read books together but making it a special thing with cuddly blankets and a beautiful book makes it more purposeful. We already go to Trader Joe’s each week but calling it a date and taking one girl while the other two are at home with Daddy makes it special. I think if we were sitting down to coffee and we were talking about this topic face to face I would encourage you to define your parenting goals and find little ways to reach those throughout the day by being purposeful with things you are already doing. Every family and parent has different goals with different gifts and personalities and Jesus gives us creativity and grace to pursue our individual calling. There isn’t just one way to be purposeful as parents. If your family loves music maybe you are purposeful to point out music all day as you hear it around town and sing in the car. If you love to travel maybe its building a family culture of travel by trying different restaurants around town from different cultures and learning about each culture. There are so many ways to be purposeful about your parenting and I would just encourage you to hold fast to what you love! “They watched their young daughter and sighed as they did. who wanted to know what the world was about? when you kid has a passion and heart that is true. of helping young Ada sort fiction from fact. She asks lots of questions. How could she resist? One of our favorite quotes from one of our favorite books! Welcome! I’m so glad you are here today for the beginning of our Living Simply series. I’m teaming up with 3 of my favorite local bloggers to share how we are focusing on mindful, purposeful living in different various areas of our lives this fall. We’ve been brainstorming this series for a while as its been on all of our hearts’ and we will be talking about living with purpose as Mamas and how that relates to our Kids, Home and Routine. This week is all about Living Simply MAMA and I hope its inspiring to you! I’m most excited to see how four different mamas seek the same goal with different families, personalities and giftings. A little about me. I’m Eileen. I live in Greenville SC with my husband Luke and our three girls, 4 year old identical twins and a 1 year old. I worked in design before the girls were born and now I stay home with them while building and selling bedswings with my husband. See more about me here if you so desire and more information about our bedswings here. When we decided the first week of our series would be about Mama and what self care looks like for ourselves in this busy season of having young children, I knew what I wanted to share. You see, over the past year my viewpoint of self care has changed a lot. It used to be just an idea of ‘treating myself’ with new shoes or a pedicure (both of which I love and do! ), but that was as deep as it went. It was a definition defined by what our consumerist culture tells us is self care. While those things are good and a definite part of self care, I’ve been working through a deeper understanding of what it should look like in my life in my daily rhythms and home. This time last year I was floundering, a newborn at home and 2 three year olds meant our house was busy and I felt like I was running myself ragged. Nothing felt really joyful in our home because I felt like I was always behind the eight ball and striving to catch up. I didn’t see how seeking daily beauty and peace in my home could coexist with 3 kids, 4 and under even though I desperately wanted it in my soul. I’ve highlighted and dog eared so many pages in this book. They talk about everything from creating the feeling of home and belonging in a hotel room on a business trip, to stock piling your pantry with stuff for soup and homemade bread in the fall and the importance of having specific family goals and traditions. It goes month by month talking about the specific joys and possibilities of each month. Its all laced with the idea that everyone is different and will have different priorities and strengths but the overarching message is to create a personalized sense of joy and beauty seeking rhythm in your home. It was like a light switch went on for me and since then the joy I’ve had in building this home has increased dramatically. The world screams at us all the time to hurry up, rush, no one has time to slow down and enjoy the day so why even try?? No. Stand against that rush. And I know we all have times when we can’t even shower we are so busy or everyone is sick and it feel so overwhelming and its just about survival. This is more about creating a permeating culture in our homes of rest and beauty in whatever way sings to our own creative soul. That creativity looks different for our each of us. Some of us may love baking with our kids, some of us love to design beautiful spaces in our home. Some of us fill our homes with sweet animals and some of us love working out every day to strengthen our body. God gives each of us different forms of creativity and delight and they all bring joy to His heart. One way is not ‘better’ than the other so don’t compare your gifts to others. I’m not a baker so I order takeout for all my kids birthday parties but I love going to my friends’ houses who bake homemade cakes for their kids. I celebrate their capacity by eating their cake and enjoying it a lot but I shouldn’t let that shake my joy in my Costco cake takeout. Here’s how that journey has looked for me. What fills my soul with delight is a beautiful home where my family and friends feel safe and inspired. Lots of time outside. Clutter bothers me mentally so I’ve created daily rhythms to keep it at a minimum (I’ll talk specifics on how we do that on our daily rhythms week!) Our house has lots of noise all the time with three young girls but I know I love feeling at peace so I play lots of music throughout the house on spotify that inspires me. Right now its lots of The Oh Hellos, Need to Breathe, Bethel, and Celtic music. Reading as a family feels magical to me (probably because we did it a lot when I was little) so we read about 5 to 10 minutes of the illustrated Hobbit (a gorgeous edition!) with the girls almost every night. I’m dying for them to be old enough to read Harry Potter. I have the illustrated copies of those ready to go when they are! I work throughout the day to make dinner time as easy as possible and set us up for success because dinner, bath and bed with three littles can feel like a never-ending marathon! I love making the house cozy so we do lots of soft lamplight and music after the girls go to bed. Taking a nighttime shower is a ritual I don’t miss and something about that steam makes me relax. We have worked really hard to make the girls love sleep and thankfully they all do. Right now ha! We had about a year when the twins didn’t want to go to sleep until 9:30 because they wanted to play together in their beds. That was rough. We finally dropped their afternoon nap and they started going to sleep at 6:45. Cue the angels singing. Striving to create a home full of magic and memories for my family restores my soul. Sure we have crazy days and tantrums and sickness and all the normal life things but it has been more about creating a culture. A culture that reflects our family values and loves and gifts and creativity. When things get crazy we hold onto those traditions and ride the wave until things settle down. This is what home and a vital part of self care means to this mama now. I want to “create a home that nourishes, nurtures and sustains life and beauty. It is about how to order your living space and what happens there to embody the joy and beauty of God’s own Spirit.” (Life Giving Home page 14 of the introduction).